The following instructions will allow you to run the simple demo norming experiment that comes with the eDom software. They can also be used to start eDom and run your own experiment after you have set up an experiment. Before creating your own experiment, it may be worth testing eDom using the included demo experiment to ensure that the software has been installed correctly and functions on your system. To run the source code in MATLAB, set the current directory to the root eDom (./eDom) directory either via the File menu in the GUI or using the cd() command, then run ./eDom/src/eDom.m. If you are prompted to change the current directory or add it to the current PATH, select add to PATH -- the current directory must be set to the root eDom directory for the relative pathing used by eDom to function correctly. These errors do not appear to be unique to eDom and are encountered with other similarly-complex standalone executables generated from MATLAB source code. Critically, however, the eDom software nevertheless runs properly and optimizations can be completed successfully by ignoring these messages. To date, we have not discovered a better solution to these non-critical errors, but if one is discovered an updated version of the software will be created. After the MATLAB component runtime has been installed, you may start eDom by launching the executable (eDom.exe) in the directory where the compressed files were extracted. Optionally, you may wish to start eDom from the command line. This may be done via Start-->Run-->'cmd' to start command line interface; then navigate to the eDom directory and type 'eDom.exe'. This will allow for eDom's textual output to persist once the program exits and may be useful for debugging or logging purposes. From a console/terminal/command line interface, run the 'run_eDom_linux.sh' shell script located in the INSTALLDIR where the eDom archive was uncompressed (but see the note below if you have problems). You should be able to do this directly in a shell such as BASH without forcing the use of a different shell. If the file is not labeled as executable, you may need to 'chmod' it to allow this (type 'man chmod' in a console for help in doing this). Once eDom has been initialized, it will prompt you to input a participant number and a directory in which to store a participant's data. By convention the participant numbers should begin at 101 and increase sequentially. Only integers are allowed (no text or .txt suffix). Adherance to this convention is NECESSARY if using 'participantLists' so that an appropriate list for each participant can be loaded and to ensure equal sampling of all words in the population. If a previous participant's data should be overridden for some reason, simply specify their participant number a second time and you will be prompted to confirm that the old data should be overridden. 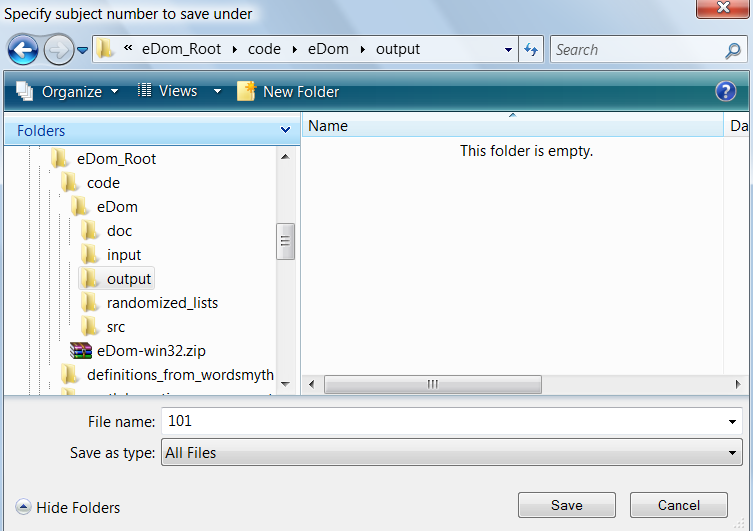 By convention, the participant's data should be stored in ./eDom/output. Once a participant number has been specified, eDom will prepare all of the definition files for presentation during the experiment. Note that if the population list is very large and/or eDom is run from a network drive, this may take more than a minute to complete. Once the definitions have been loaded, the norming experiment begins automatically.